If you’re a regular reader of my blog you will know that we moved house just over a year ago and we’re slowly turning from a house into a home. If you’ve moved house you will know that quite often when you move your furniture doesn’t always fit the way you would like in the new room. This was definitely the case with our bedroom furniture and it also got damaged during the move. The removals insurance did cover the damage and we’ve been saving up the rest of the money to completely change the furniture in there. All the walls were white and I wanted to add to warmth and cosiness to the room. I painted the main wall a pewter colour, which draws the walls in and makes the bed a real focal point of the room. I’m really lucky that my husband said yes to the gorgeous pink bedside tables that I fell in love with the minute I saw them. One item of furniture that I’ve never owned is a dressing table, I would always sit on the floor in front of the big mirror and do my hair and make up. I’m not getting any younger and it’s hard work sitting on the floor all the time (poor me!). A dressing table was definitely an item I wanted to make sure we fitted in. After all this is our forever home and I can’t be sitting on the floor when I’m 80! The biggest decision we had to make was what to have at the windows. I definitely seem to be moving away from wanting to have curtains at our windows. We currently don’t have curtains downstairs and the only rooms that have them are the girls bedrooms. 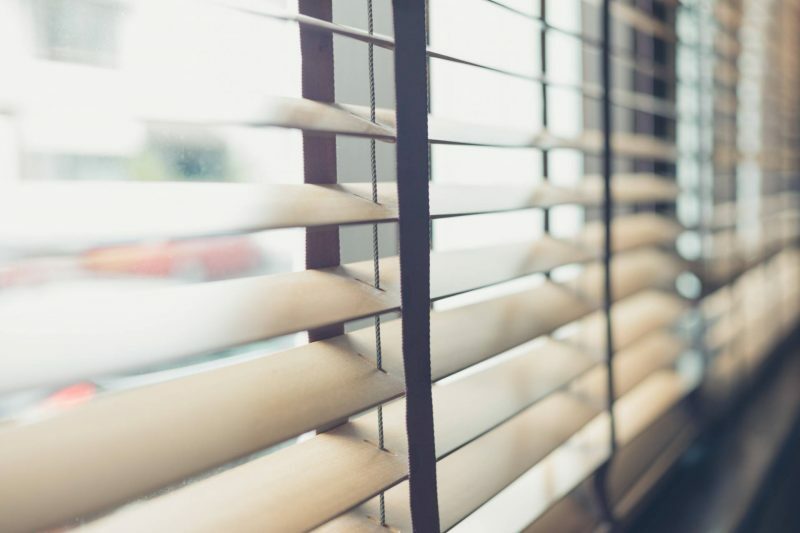 I love the look that wooden venetian blinds give a room, they are modern, stylish and classic at the same time. The advantage that they have is the ability to be able to control the amount of the light that comes into the room and this is what draws me to wanting them in our bedroom. Our window is at the side of the house and it gets a lot of light into it, by having venetian blinds I can control this better. Whilst also making sure our nosey neighbours can’t see in! As with most things when it comes to house purchases it will come down to cost and alternative would be to have Velux blinds instead. We had these in our previous house and they did a brilliant job at keeping the light out. I can’t wait to have our bedroom finished and share with you the end results. Interiors is one of my favourite things to do and I spend hours finding the right items for each of our rooms.